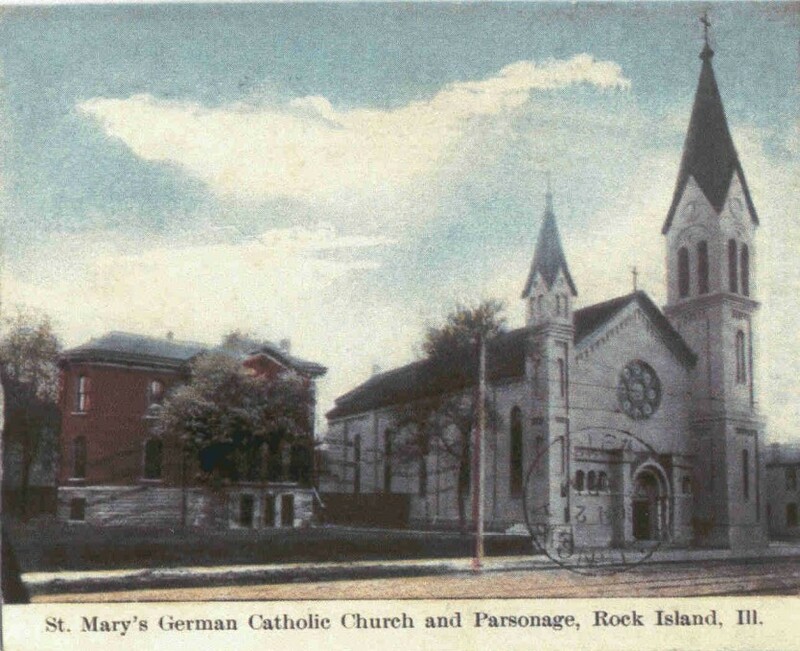 This rare postcard from Shannon Hall’s collection shows St. Mary’s Church and Parsonage as it appeared about 1910. The church, initially known as St. James, was established in 1851 by missionary priest Rev. George Alleman. During that year, construction of a modest church on 4th Avenue and 22nd Street (or Rock River and Dock Streets as it was then known) began using stone quarried from the site. When lack of funds temporarily halted the construction, Davenport’s Antoine LeClaire, a Catholic, came to the rescue. He provided enough money to the new congregation to complete the 61 x 30 foot church that was dedicated in 1852. The following year, a small, 14 x 16 foot, frame rectory was constructed. Fr. Alleman would live there for the next ten years until his retirement. In 1863, a new church was under construction and the old stone one was demolished to make room for a sacristy at the rear. Stones from the destroyed Mormon Temple in Nauvoo were incorporated in this construction. As late as 1868, interior plastering was still in process. Once the church was finished, it was time for a new rectory, which was begun in 1869. By 1875, the congregation, now called St. Mary’s, was building a small frame school behind the church. The story of St. Mary’s School is the subject of another postcard story. Work on the church continued over the years – adding altars, a baptismal font, and, in 1891, stained glass windows. The following year saw construction of a two-story brick school building. In 1904, Rev. Adolph Geyer, the 13th pastor of St. Mary’s, took over the church. It was under his ten-year stewardship that the appearance of the church and rectory or parsonage was changed to that on today’s postcard. Although the postcard picture shows a gray stone-like church, the exterior was still the original red brick. However major changes were made to the main, 4th Avenue, façade. Where the original church had three small round-topped entrances between the towers, fronted by a continuous swath of high wooden steps, the remodeling created a single large recessed and lowered entrance. Church records say, “A beautiful arch supported on each side by two marble columns was erected, and under it were placed double, massive, oak doors.” Triplets of small round-topped windows framed the entrance and a few stone steps provided easier access to additional stairs inside. The upper level, which originally held three round-topped windows, with the middle one taller than those on either side, was modified to hold a single huge Gothic-style “rose” or round window that was centered over the choir gallery inside and the entrance outside. Other 1891 windows, which were probably simple geometric colored glass, were replaced with more ornate figural opalescent glass. More visible improvements under Rev. Geyer’s leadership included redecorating the church and adding carpet. Less visible work added steam heat to both the church and school and improved the plumbing facilities at the school. The east side of the rectory also was given a new two-story addition. This appears on the postcard as red brick, although it is now painted gray. It is a classic Italianate house with a low-pitched roof edged by bracketed eaves. There is an unusually high basement and round-topped windows. Although some of the windows have been replaced with rectangular panes, the house still appears much as it did a century ago. Rock Island architect George Stauduhar may have been the designer for the remodeling of both the church and rectory. His archives at the University of Illinois list drawings for a “Roman Catholic Church” in 1904, as well as undated drawings for “St. Mary’s Rectory.” Stauduhar was the primary architect for Catholic churches in Rock Island and had a strong following throughout the Midwest. In more recent years other changes have been made to the church. In 1967, a modern glass vestibule and a glass baptistery were added. Although the historic church was still visible through the glass, the additions allowed easier access from the street, which had been widened over the years. The 1960s also saw the installation of even newer stained glass windows. Although the old steeples were removed in 1970, the bell was reinstalled in a modern belfry atop the newly stone-veneered walls. This article, by Diane Oestreich, is slightly modified from the original that appeared in the Rock Island Argus and Moline Dispatch on October 8, 2006.